Back in my day, all a hardened gambler needed in the morning was a cigarette and a glass of scotch. These days, you kids have it easy with your iPhones and fake gambling and fancy breakfast foods! Pancakes and real maple syrup? Feh! So…yeah, a fake slot machine themed around breakfast. Makes total sense, right? I don’t mean to say that the slot machine isn’t real. It certainly works like a slot machine, but the gambling is 100% fake, although kids are still discouraged from playing with this one for the same reason we don’t sell bubblegum cigarettes anymore. With Breakfast Slots, you have a five reel machine and 20 potential paylines to bet on. You have the option of adjusting a number of things, including currency of choice, odds, and starting bankroll, although if you want to compare your earnings with other players online, you have to stick with their default settings. Matches, starting either at two or three, begin from the far left, and different foods are worth different amounts. Orange juice is a wildcard, and coffee is a scatter match, so you don’t need to get them all in a row. Get three or more coffees and you enter a bonus round. I didn’t like the bonus rounds, largely because they didn’t make any sense to me. These were all mini-games based around preparing breakfast, activities like cracking open an egg or flipping a pancake, but the controls for each were all different and rather baffling. At least for some of them, the payout seemed random, but that wasn’t totally clear. Paylines are also tedious to set up, since you have to cycle through all 20, and you don’t have the option of picking and choosing specific lines. I also have no earthly idea how you’re supposed to get the jackpot. Odd though it is, I can see the appeal of these fake slots, but Breakfast Slots just isn’t the best example. 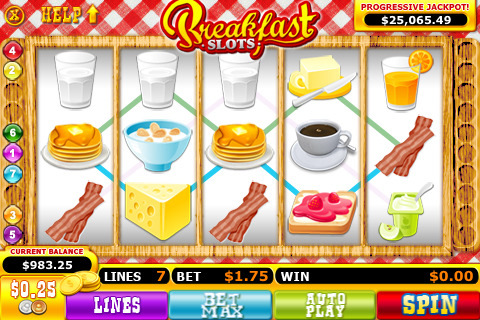 So much of the appeal in slots comes from appealing sounds, and Breakfast Slots suffers from poor sound choices. The jarring banjo plink when a coffee appeared was the worst, but in general the sound was just disappointing and the graphics only so so. If the developers really wanted to get clever, they should have capitalized on the recent bacon craze and made bacon the most prized food or made it the wildcard to show how bacon goes with everything, but, sadly, the only thing keeping Breakfast Slots moderately tasty is the price. If you’re broke from real gambling, Breakfast Slots will help you get your faux-gambling fix on the super cheap, but the rest of you are probably better off without this one-armed bandit spinning its reels at you. AppSafari review of Breakfast Slots was written by Tracy Yonemoto on May 11th, 2010 and categorized under App Store, Free, Games, Mini Games. Page viewed 3894 times, 1 so far today. Need help on using these apps? Please read the Help Page.